Some of the coolest sounds you’ll hear; a jangle monster but with enough bite for blues/classic rock. You’ll need to maintain the neck, but the resulting feel is wonderful. Eric ‘Smitty’ Smid started playing guitar in his teens during the mid-70s, inspired by discovering the late Jimi Hendrix. Along with those Classics, Eric currently offers four original outlines, which can be custom ordered (90 per cent of his builds are custom orders; he doesn’t build for stock). Model 1 has rounded Gretsch-like lower bouts with a more slanted Tele-alike shoulder and treble horn. Model 2 (“My ‘Tele’,” laughs Eric) retains that upper body style but with a reversed offset lower body, a solidbody design that’s a blank canvas for any hardware or pickup configuration you can think of. Model 3, on review here, keeps that reversed base but has a more extended Jazzmaster-ish horn. Our Model 4 is still a bolt-on with a very similar Fender-scale neck (though with no amber tint) and obviously with a reverse headstock, yet the bigger body here is alder, which contributes to a heavier build. Aside from the neck and its join, it’s altogether more Gibson-like with a Gotoh Nashville- style tune-o-matic and stud tailpiece, four controls laid out in Gibson-style and three Lollar custom mini-humbuckers. The shoulder-placed toggle selects neck, bridge or both as you’d expect, and the middle pickup only comes into play when you pull up the neck pickup’s tone control, giving neck and middle, bridge and middle, and all three in middle position. Both Model 3 and 4 guitars use similar electronics: Emerson Pro 500k pots, Switchcraft output jacks and an Alpha pull/ push pot. Along with that, the recently-reviewed Model 3 and the neck pickup of the Model 4 use Soviet K409-Y 0.022microfarad grey tone caps; the bridge pickup on the Model 4 uses a slightly heavier brick-coloured K409-Y rated at 0.033 microfarads. The neck here adopts a biggish full C, the Model 4 slightly bigger and deeper in depth than the Model 3, and it also benefitted from a light rub with a fine abrasive pad (if it was ours, we’d probably apply some more coats of oil, too). The nicely rounded fingerboard edges go some way to remove that slightly new neck feel. Setup-wise, it falls into modern protocol with 1.6mm string height on both treble and bass. The Model 4 couldn’t be more different than the Model 3. First, its lower output might need compensating for (we just kicked in a slight clean boost), but its mixture of ingredients produces an exceptional clean ringing voice that redefines jangle. And that’s just the bridge pickup, which, whether paired back by the construction materials and bridge style or not, is single coil-like clean but without the spike. Add a touch of crunch and a big reverb and it sounds cathedral-like huge. The neck pickup is a little louder, but adds depth to the highs without a hint of mud; the clarity is a beautiful match for the bridge. Meanwhile, the mix, for any soul or pop vibe, is snappy, textured and sort of sits between a Tele mix and a low-output Les Paul mix. Glorious. Pull up that switch on the neck tone and you introduce the middle pickup. With the volumes full up, your neck selection on the three-way toggle becomes a Strattier neck and middle; likewise, the bridge. In the mix position, all three are on and... well, it’s not always our favourite sound, but here jangle meets depth with some Fender-y in-between bounce for flavour. A neat thing is that if you’re on bridge or neck position in this mode, as you pull back the volume it voices the middle pickup, a great little trick that works very well, adding to the immense number of subtle shades this guitar produces. 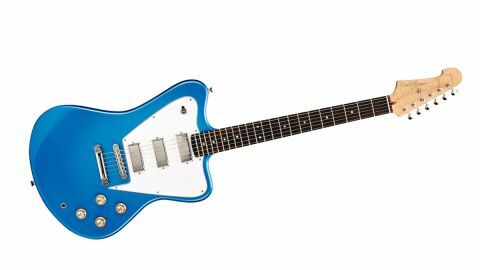 It could sit in so many genres, from the 60s jangle of The Byrds, the psychedelic swagger of The Stones, most of The Beatles, and if Mike Campbell doesn’t know about this guitar, he should, either to run through his old bands’ tunes or indeed his new band’s repertoire. Quite a piece. Eric ‘Smitty’ Smid will make you any Fender-style guitar of your dreams and we doubt you’d be disappointed, but the appeal here is of a more mixed-up, creative vision, and it’s hugely rewarding. This is a stand-out instrument. The Model 4 initially sounds a little demure, but compensate for the lower output mini-hum’s and you’re rewarded with a beautiful clean humbucker-meets- single-coil voice that is jangle heaven with bite and smoothness in equal measure via its neat circuit. Okay, so there’s no shortage of small shop builders that will make you a fabulous guitar for around £3k. All we can say is that not all of them have quite the sonic vision or guitar-playing experience of Eric Smid. You really should experience this.